Ordinary Goodness: Stephen shows up. 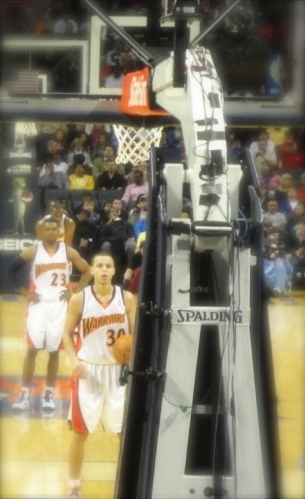 This Stephen Curry - have you heard of him? This joyful kid with the silky shot, the guy who's got elegance personified down pat, the guy who sinks grace deep in the net and points up to greater grace high in the sky, the player who's taking over the NBA playoffs? Yeah, him. So, when did he show up? Maybe it was Sunday night, when he dropped those 22 points in 390 seconds in the third quarter, in the playoffs, and went as rockin' jubilant as the golden-shirt thousands in the stands. Maybe it was February, when he dropped 54 in the Garden and did a little shimmy and was so into the moment that he missed his teammate Draymond Green's high five and felt bad enough about it to reenact it the next day for all of Twitter to see. Maybe it was last September, when the sun shone deep and bright on the back brick of Baker Sports Complex in Davidson, N.C., and shadowed into the woods, where he and the rest of the Davidson community gathered for a 5K race supporting his teammate Andrew Lovedale's foundation. Maybe it was the fall before that, when the league was locked out and so he went back to class with current students, and practice with current players, and walked the familiar brick pathways that had helped to forge his future. Maybe it was Bob McKillop basketball camp, where he came and played pick up with his friends and teammates as the summer dusk fell, showing the campers who stuck around in the stands what it means to find a place that matters. Maybe it was the day that was supposed to be his college graduation, when he sat in the audience to support his friends, and gave my brother the treat of his life to shake his hand and take a picture. Maybe it was coaching a kids' team at his best friend's charity event, laughing and talking and passing the ball to them as they practiced. Maybe it was his first NBA game in front of the home crowd, when we all filled Bobcats Arena with red and the Wildcat mascot was there and we cheered only for him, and he grinned and pointed back at us. Maybe it was during his first NBA preseason, when he sent a postcard to alumni and students thanking us for our support through the years. Maybe it was the first Thursday night of senior year, when he turned up at the Brickhouse before he left for California to hang out in the town that knows and loves him best. Maybe it was his first NBA press conference, when he flew to Oakland and stood with Dell and Sonya proudly holding his new jersey, and a kid in the audience asked why he wears the number 30 and he explained it was because his dad wore it, and he wore it in high school, and in college, and he said our name again, the name of our place, and I beamed.